Coolest combinations for School Uniforms in Chennai !! The birth of an idea, the dedication and hard work of a group of people who wanted to give their consumer the very best saw the RSM group grow into a organisation where the policy of quality consistency fabrics comfort and value for money materials, became the organisation basic foundation. Nearly three decades ago the RSM group started their humble beginning with a lot of dedication, intensive research and with the hard work and expertise of their capable employees. The RSM group in Chennai grew to become a household name in our country and rising star in the national horizon, The RSM group manufactures their fabrics using the most superior quality imported looms. The Suljer looms and Donear looms are used to produce fabrics that are wrinkle free, with a variety of enzyme, paper and peach finish. The RSM group in Chennai specialises in Shirtings, Suitings and School Uniform fabrics. There is vast range of mix and match fabric, stripped designs, checks and plain colours to choose from . The quality of fabrics range from polyester viscose. a soft textured fabric for school children, polyester cotton, 100% cotton, terry cotton and industrial fabrics for economical uniform for factory workers. With a vision in their mind the RSM uniform group in Chennai works with all sincerity dedication and using the latest technology to give their valued customer what they deserve the most, the very best of fabrics for the generation to come. The season of summer and the season for School Uniforms go hand in hand. 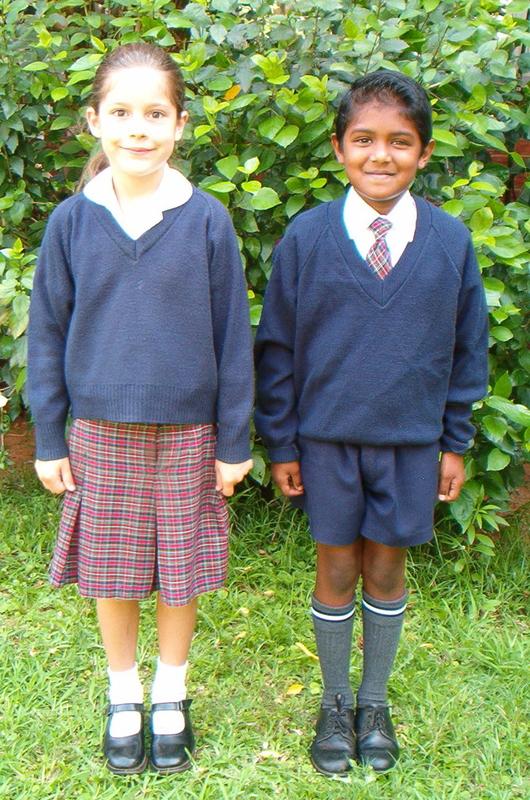 We at RSM Uniforms hereby present the best combination of school uniforms available in the market. These combinations are trendy and suitable for class from L.K.G to standard 12th. Crisp and clear embroidered logo from Japanese barudan machines. RSM Uniforms being a quality conscious organization are very particular on the company’s logo that get embroidered on the pockets of the shirts. The embroidery done is from Japanese machine named Barudan and is best in its class of embroidery machine available in the market. 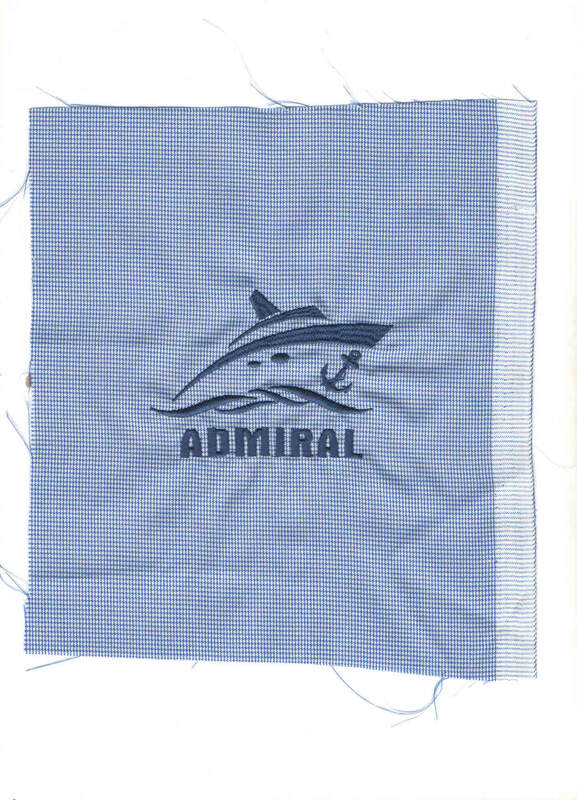 Get a glimpse of the embroidery done from the Barudan machine for a shipping company in Chennai. 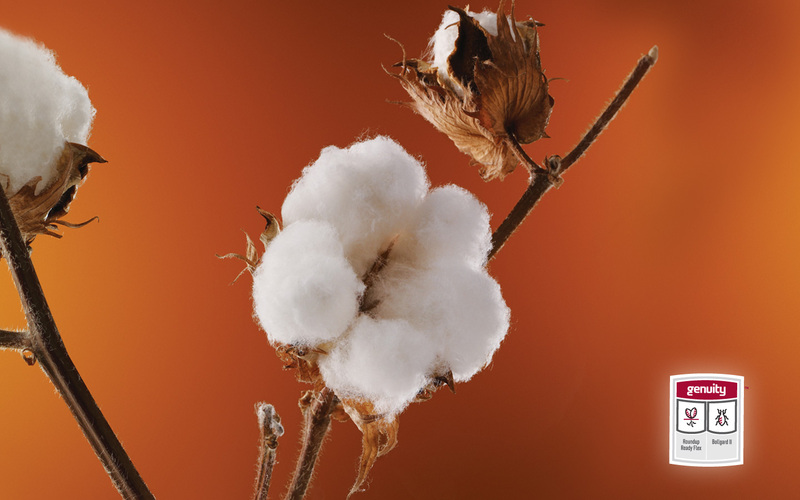 All about Cotton – The White Gold !! 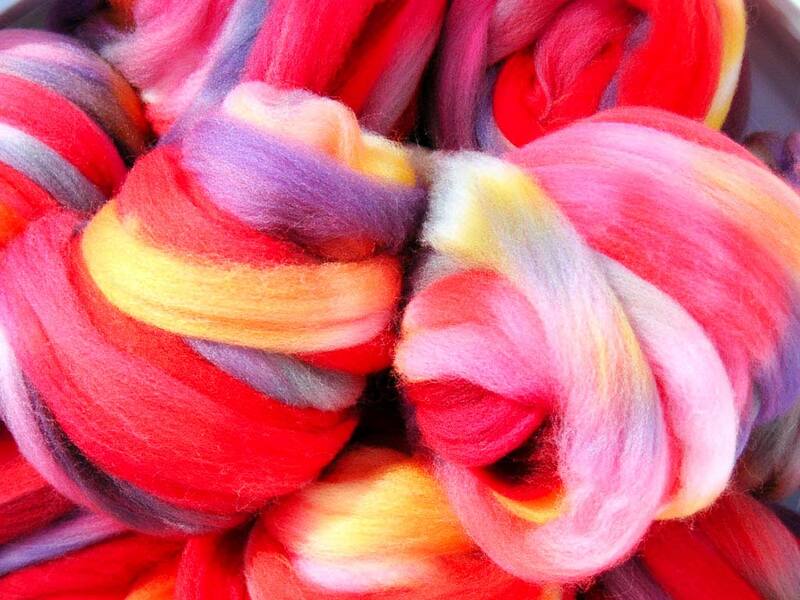 Cotton is the most predominant fibre, accounting for almost half of the world’s fibre usage. The crop is harvested either by hand or by machine and is then cleaned or ‘ginned’. o 10-25% stronger wet than dry. o Resistant to mechanical action, strong cleaning agents and heat. o Less expensive than linen and wool. o Creases badly (can be improved with chemicals). o Poor stretch and elasticity (except when used in jersey knits). o Poor crease resistance (can be improved with chemical fixatives). o May shrink, by up to 10%. Frosts are used to defoliate crops naturally. Sometimes a mild salt solution is used. 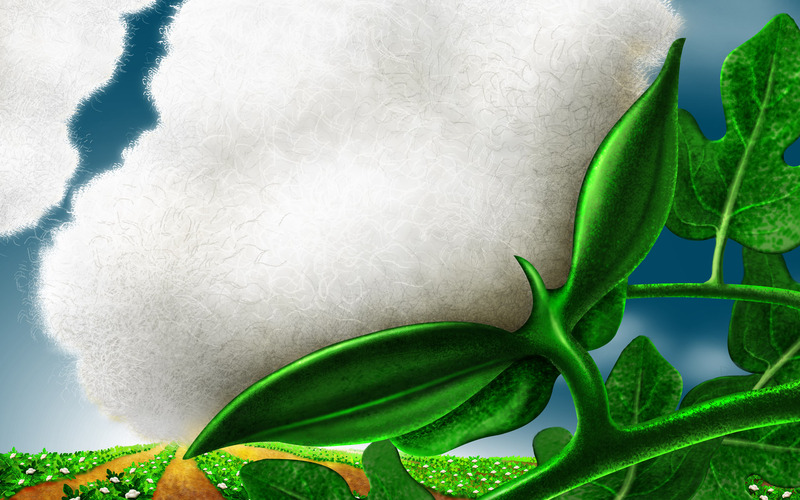 Cotton has to be cultivated ecologically for 3 years before it can be called organic. Old Chennai schools don new uniform ! Sweeping pathways, wide staircases and high ceilings are a few markers of antiquity that greet visitors at any of the older schools in Chennai. Established at the turn of the century, these structures are refreshingly incongruous amid the urban sprawl around them. However, along with retaining their vintage feel, a handful of such schools in the city are also adopting practices that ensure they remain relevant to the current generation of students. From in-house teacher training programmes to adopting the latest digital technologies, school heads are constantly rolling up their sleeves to see to it that lessons in their decades-old classrooms remain fresh even today. Keeping the future of students in mind, the inputs in these schools are being tailored towards equipping them to handle life after school — be that in the form of digital literacy, fluency in English or hands-on ability. Madras Christian College Higher Secondary School in Chetpet, among the oldest institutions in the city, turned 175 years old this year. Under the leadership of Kuruvila Jacob, who took over the reins as school principal in 1931 at the age of 26, the institution entered an era of academic and administrative reforms that have stood it in good stead. From influencing macro details in building the school’s infrastructure, teachers remember Jacob as a man who looked into micro-details of building students’ character as well. Educationists continue to impress that striking this balance is vital. For instance, the school today has smart boards’ in its classroom which enable teachers to teach better. Largely seen as the means towards building a solid foundation for students — in that they are clear with the fundamentals due to the engaging visual input — teachers add that a seamless integration of technology with the chalk and talk’ method is the ideal situation that can bring about optimal development of a student. “When teaching subjects like Science say the working of the human heart in Biology they can chart out the concept on the blackboard and explain it in 3D on the smart board for students to understand better,” said G J Manohar, the school’s present principal. Another aspect that schools are continually attempting to work on with regard to their students is English fluency. With a majority of information resources, both in print and online, being available in English, school heads are beginning to recognise that students will lose out if they are not pushed to using the language. In addition to being blocked out of the means to develop their intellectual ability, there is also the question of employability which can be tackled only with a refined knowledge of English. “For instance, we introduced a Rule of Language’ two months ago wherein we have told all students that they should only speak English inside the campus. If they speak any other language, they will be given a card for it and will have to work with a teacher to remedy it. Already, we are seeing a marked improvement in students’ communication skills due to this,” said principal Father Gregory Devarajan of St Bede’s Anglo-Indian Higher Secondary School, which was set up in 1906. In keeping with global trends in education, the importance of practical expertise is an aspect that has century-old schools constantly revising their policy as well. While theoretical knowledge helps them score marks, the conversion of their know-how into hands-on work is a widely-acknowledged lacuna in the system. Authorities at Lady Sivaswami Ayyar Girls Higher Secondary School, set up in 1869, are attempting to set this right by organising short-term workshops such as a recent module on Tanjore painting. Along with this, students in class XI are also offered electives on jewellery designing, painting and generating household articles from waste. Together with initiatives that are trained at students’ development, select institutions are working on teacher training as well. Regular, focused and learned feedback on a teacher’s performance is a practice that is widely used in primary education in countries abroad such as the US but is largely absent in schools here. At institutions such as the Olcott Memorial High School, however, there is a clear emphasis on keeping teachers’ motivation levels high. “We have regular meetings for our staff once every 15 days on issues like role-modelling, punctuality and to reinforce their commitment to the school. We have meetings with subject teachers every week wherein the senior teachers, who are often sent on workshops, share what they have learned with their younger colleagues,” said school principal Lakshmi Suryanarayanan. According to educational consultants like S Sailakshmi, who constantly liase with the industry and educational institutions, the future lies in students being both tech-savvy and have sound reasoning ability. “In an increasingly competitive world, it is understandable for schools to introduce steps like ramping up their technological resources and introducing language development. Each parent expects age-old schools to initiate steps like this so that their children can keep up with the times. For schools to survive and for students to thrive, it is essential that they constantly renew their policies to stay relevant,” she said. Top Ten reasons to wear RSM !! 1.Absolutely the best quality uniform available. 2.Uniforms “customized” for your school – plaids, styles, fabrics and a full range of logo wear. 3.Easy shopping – In store, online, mail order, fax or phone. 4.Great Service – From Live chat to Facebook and Twitter. 5.RSM Advantages program – benefit your school. 6.Your partners in education – supporting programs and kids. 7.Special annual sales and shopping promotions – Great savings. 8.Made in Bhilwara, Rajasthan from our own unit. 9.Family owned business – Making uniforms since 1980. The right work uniform is certainly one of the most important investments you will be making for your business. The uniform is what will set the standards for the comfort and look of your employees, and even dictate what kind of impression your business makes on your clientèle. It is necessary to buy work uniforms, no doubt; but what is more important is to buy the precise kind of uniform your business warrants. Here are some pointers for you to keep in mind when you set out to buy work uniforms for your establishment. Buy work uniforms that have the look. Work uniforms are not school uniforms. They need to have a classy look if they are going to influence the impression your business will make. Whether you are buying work uniforms for the employees in your office, or for the employees working within the factory, you need to select real elegant stuff for them. At the same time, you have to make sure that the work uniforms you buy will fit the designation of the employee at work. Buy work uniforms that lend comfort. The work uniforms at your enterprise should not be only about glamor. The comfort that the uniforms give to the wearer is of paramount importance. Remember that your employees will be wearing work uniforms for the major part of the day, in which they are going to be very active. That is all the more reason that they should be comfortable with what they are wearing. Whether they are going to sit at a desk for several hours at a stretch or work in your factory unit manufacturing your products, they need to be at ease. This should be one of your main objectives when you are buying uniforms for your business. Buy work uniforms that have a sense of uniqueness. Every business will have some or the other kind of uniform of their own. You need to make sure that the uniforms you have chosen for your employees are different from the other run-of-the-mill uniforms in the market. It could be the color or the pattern, but there should be something that goes with the theme of your business. Many workwear manufacturers nowadays agree to customize work uniforms according to your needs. You could have them in a particular colored theme, or you could get your company’s logo embroidered on them. Check what option suits you and go ahead. When people see your employees, they must associate it with your business. The good news is that you will find exactly such kinds of work uniforms at our site. These uniforms have the kind of grace, flexibility and brand appeal that you are looking out for. Plus, we have a catalog that includes the best manufacturer labels in the market. Whichever brand you want to buy work uniforms of for your establishment, you will find them here, and at cheap prices too. Since we do not need to rent out space in expensive shopping malls to display our products, we are saving money. And we are passing on those savings to you. Just check out our catalog before you buy work uniforms for your employees. You will know what we are talking about.